In winter, many women are faced with the challenge"What to wear" - for winter clothes are not cheap, and if the summer to the dress shoes are required only in the winter need to think about outerwear, jacket, warm tights, leggings, etc. Read: How to make a basic fall wardrobe? How to cope with this legitimate concern, do not skimp polmagazina women's clothing? The solution to this problem would be correctly drawn up a basic wardrobe for winter 2014. 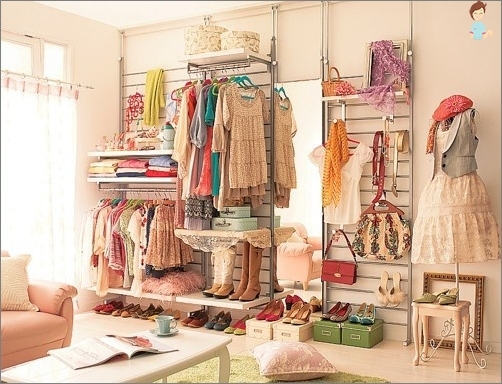 Each element of the wardrobe should in harmony with the 2-3-bedroom things color and style. Color spectrum basic winter wardrobe should be simple and not very bright. Do not worry - to make it more colorful and original, you can use favorite accessories. It is desirable that all the basic things were high-quality. After all, the main cloakroom is worn for a long time, and then it can be supplemented with cheaper things, lossless appearance. So what are the essential things should go into winter wardrobe? 2 types of outerwear - In the cold and warm winter. For example, demi-season jacket and sheepskin, or light winter jacket and fur coat. 3 pairs of shoes - Very warm and comfortable, lightweight and waterproof model. Read: Fashionable boots for the winter 2016-2017. 5 skirts or pants - It is important to take into account the already existing top. Shirts, vests, cardigans, sweaters, blouses - They must be purchased in the last turn. Pay attention not only on the thick knitted sweaters, but also in the cozy turtleneck, stylish blouse, fishnet vests, thin shirt. Usually these things are not expensive, but are making a significant diversity in the winter wardrobe. Stylists are advised to buy warm knitted tunic or dress. They are good because they do not require extra things and they are easy to combine with footwear and outerwear. Do not forget the upcoming holidays and think your festive attire beforehand. In conclusion, let us admire the starry winter bows from Victoria Beckham, Gwen Stefani and other stars. Do not be afraid to experiment with prints and accessories, if you a gray coat, black hat and black leggings. Dark blue sweater, jeans and simple boots Create a calm neutral image, which attracts the attention of the unusual bag-chest fashion camel shade. Gray checkered coat and a black sweater - Boring? No, if you put on a seductive red leather pants. Grey hat ideal for surface-gray fur collar. Gentle cream coat and black trousers business give the image of elegance and effortless chic. Infinitely neat textured cream sweater perfectly with self-colored jeans. And all this splendor emphasizes strict blue coat in military style. Here, in the first place - fashion accessories trendy neon colors - bag and necklace. Black set of leather pants and sweaters allow in any situation look smart, we need only to change the decoration. White trench effectively sets off the black ensemble and emphasizes the beauty of the girl, brunette. The first thing that catches the eye - it is long legs that look like this at the expense of high ankle on the platform and plain tights. Red dress It catches the eye, and White coat It dilutes the image, making it more daylight and fresh. See also: Fashion tights in the winter of 2013-2014. Despite the modest range of colors, this image does not contain bright accessories. Greater importance is attached to the invoice and forms. Leather gloves and an elegant hat restrain sexuality short skirt and stockings.